Hey! I know that all of us are busy with work and deadlines but don’t forget we need a life too. To me work life balance is important to energize and keep me going. I decided to squeeze in sometimes to chill out and catch up with friends at Tiki Taka, Medan Damansara recently. This has becoming our sort off monthly after work happy hour gathering. I enjoyed the companions and chats because each of us has our stories to share when we meet up while enjoying the special prepared food and pints of CONNOR’S Stout Porter. It was A Night Made Right @ Tiki Taka, Medan Damansara. Remember don’t drink and drive because it’s very dangerous, risky and even we are sober we might get into trouble when there is road block. Be smart and drink responsibly. Better be safe than sorry, right. I took GRAB Car to Tiki Taka, feel like a boss being chauffeur to my destination. Even there was the after office hour jam I just chill in the car, check my emails and social media. Reached Tiki Taka earlier than expected and saw some friends already there too. We started to chat and drink while waiting for the rest to arrive. The restaurant is quite cozy they have al-fresco dining too. Had my chilled CONNOR’S Stout Porter served with perfect creamy dense foam head. I am used to drink CONNOR’S Stout Porter because of the crisp texture, the right robustness of aroma and creamy flavour. A brew that was just made right gives me the relaxing and pleasurable moments. Connor’s Stout Porter is inspired by the original British Stout Porter recipe from the 1700s Great Britain. Having a good time with friends over pints and pints of easy to drink CONNOR’S Stout Porter is kind of rewarding after a long day at work. You don’t need to be larger than life or jump through hoops to enjoy it. No fluff. No drama. No pretence. It’s just a great brew for good times with friends anytime. Indulge in a taste that’s… Just Made Right. Are you into salted egg and pork? If yes, you hit the right note here. What is so special about this CONNOR’S Salted Egg Pork Burger? You would never expect that the black burger bun is infused with CONNOR’S. According to Chef Carrie at Tiki Taka, the black burger bun is infused with CONNOR’S to gives a soft malty and fluffier texture. Then, the battered soft pork loin is deep fried to perfection and topped with salted egg, chopped cili padi, curry leaves and butter based sauce. When we bite into the burgers it gives a very satisfying feeling of malty soft black bun, crunchy battered deep fried pork loin and the salted egg with a hint of spiciness fragrant creamy sauce. Perfect when we have a sip of CONNOR’S Stout Porter after each bite. Never knew that the combination of burgers and CONNOR’S Stout Porter can be so savoury. BBQ Pizza is one of the easy going finger food at the same time filling too while you are watching your favourite sports match or having a chat at the bar. What is so special about this CONNOR’S Sriracha Chicken Pizza is that the chef infused CONNOR’S in the Sriracha BBQ sauce overnight to bring out the flavour. The thin crust pizza is topped with pulled chicken meat, picked shallots with vinegar and sugar, coriander leaves to gives the Mexican flavor and freshness. Eat it with fingers, it’s a sweet and spicy pizza with a slight tanginess from the CONNOR’S and crunchy from the picked shallots and bell peppers. This is a must try dessert! I love it and don’t mind coming back for the CONNOR’S Bacon Vanilla Caramel Sundae again. It’s a total indulgence, one will always have room for desserts. The soft madagascan vanilla pods ice cream topped with popcorns, CONNOR’S-infused caramel sauce, espresso on the bottom and a strip of crispy bacon. The best way to enjoy it is to scoop the different layers in a small spoon and indulge the taste. I tried to use the crispy bacon to scoop the ice cream and eat it together; omg is so good. Thinking of it makes me salivate. I never expect that ice cream and bacon can paired so well, it’s kind of addictive thou. The sweet, salty and rich buttered popcorn and CONNOR’S caramel sauce with a hint of espresso on the soft vanilla ice cream and the crispy smoked bacon gives a pleasurable and multi-sensorial experience. After dinner we had more pints of CONNOR’S Stout Porter and also watched the bartender at Tiki Taka did the 3 parts pour. The perfect pour is when you get the foam right on top of the curve if CONNOR’S Stout Porter logo. 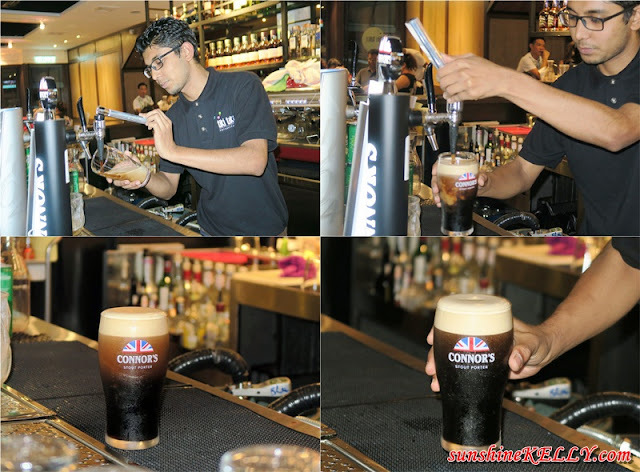 Enjoy every sip of CONNOR’S Stout Porter served with perfect creamy foam head with satisfaction. Connor’s Stout Porter is only available in draught and contains 5% ABV. Overall the dishes that we had that night were satisfying and I am still thinking of the CONNOR’S Bacon Vanilla Caramel Sundae. According to the chef, the all the dishes are global flavour and infused with CONNOR’S Stout Porter. The burger and pizza come with Asian twist that why we have the salted egg and Sriracha sauce. The sundae is an indulgent dessert that gives a sweet, memorable and sensorial ending to the night. Please take note that all prices above are subject to 5% service charge and 6% government tax. Outlet is open Weekdays from 4 p.m. to 1 a.m. Outlet is open Weekends from 9 a.m. to 1 a.m. Kitchen is open Weekdays from 4 p.m. to 11:30 p.m. Kitchen is open Weekends from 9 a.m. to 11:30 p.m. When we are call off the night and leave, I ordered my GrabCar home. It only took 10 minutes to book and wait for the GrabCar to arrive at Tiki Taka to take me home. It is always safer to take GrabCar then driving when we go out for drinks. CONNOR’S Stout Porter also embrace “Drink Responsibly” mantra through partnership with Grab; whereby we can enjoy free ride to and from each participating outlet. GRAB (formerly known as MyTeksi) is now offering a discount for all who take the ride with Grab either via Budget Taxi or GrabCar to the CONNOR’S Experience participating outlets. This exclusive discount from Grab will be RM8 off for 4 rides to the participating outlets for customers that pay via credit/debit card only. Use the promo code GRABCONNORS to enjoy the exclusive discount. Grab customers that ride with Grab to the participating outlets are entitled for a FREE Half Pint of CONNOR’S Stout Porter. You just need to flash your booking receipt to enjoy this reward. Each booking receipt is entitled for 1 FREE Half Pint of CONNOR’S Stout Porter. The CONNOR’s Experience is all about fully enjoy ourselves with friends; from the delectable CONNOR’S-infused dishes paired perfectly with a pint of CONNOR’S Stout Porter at great prices to getting home safely after a fun night out. It’s A Night Made Right with our buddies all packaged in one amazing deal. wow!!! I'm not a good drinker but this blog makes me wanna try it out. Connor's Stout , Haven't get to try before but definitely gonna try it . must be a nice place to hang out with fren! Beautiful place for catch up with friends ! Dark beer is just tasty ! omg! !the salted egg burger make me hungry now!! I don't drink at all but I wouldn't mind the experience. Besides, the sundae looks fantabulous! you're looking great here babe! the caramel sundae looks sooooo delicious! Oh that caramel sundae is super delish. Overall, the whole thing looks very classy. Awww~~ the Salted Egg Pork Burger is the bomb!!! And only RM36 comes with a pint of stout?? That's a really really good price! looks so sinfully yummy! salted egg burger is always for the win! tikitaka.. i like the sound of the restaurant.. :) bring me there again soon! The food looks good. Esp the vanilla sundae!